The word ‘postpartum’ seems to have a negative connotation these days. If you google ‘postpartum’ the first few pages are all about postpartum depression and other health-related issues. It’s wonderful that these issues are being talked about but postpartum is so much more than depression and anxiety. The word ‘postpartum’ means the time period just after birth. That time period where baby is freshly born and mom is recovering from one of the most intense physical experiences on earth. Immediately after birth, a woman’s body experiences a rapid flux. The hormonal balance is disrupted, there is significant blood and fluid loss, and milk production begins, all within 24 hours. Plus you now have a lovely new baby to attend to, so it makes perfect sense that these ancient traditions were created solely to help make that transition easier. It’s time that we reintroduce this ‘lying-in’ period to our modern lives. It’s the ultimate bonding experience for baby and the ultimate act of self-care for you. The healing time for a new mom should be holistic, addressing both body and spirit. Be encouraged to process the birth experience, rest, and have access to healthful foods that will help replenish the body. Eating well during the early postpartum period can speed up and smooth the recovery process, which in turn will help be prepared to exercise when the time is right, which is typically around six to eight weeks after birth. Create a postpartum survival plan, take it slow, be gentle on yourself and cherish the time you have at home with your loved ones no matter how long it is. Prepare your postpartum survival plan like you’ve prepared for baby. You won’t regret it! Next, prioritize what’s most important to you. Then have a very honest conversation with your partner and loved ones. Show them your list and let them choose something to help you with. You may be surprised to find out that they’ve just been waiting for you to ask. Make sure all your priority needs are met and be willing to just let go of anything else that you can’t find someone to help with. Bonus tip: In order for a support system to actually work, it’s crucial for you to allow yourself to be helped. Moms often succumb to the fallacy that they “should be able to handle it” and that they are weak, incapable, or “not good enough” if they accept help. This is so far from the truth. So banish those thoughts and get to making your list. 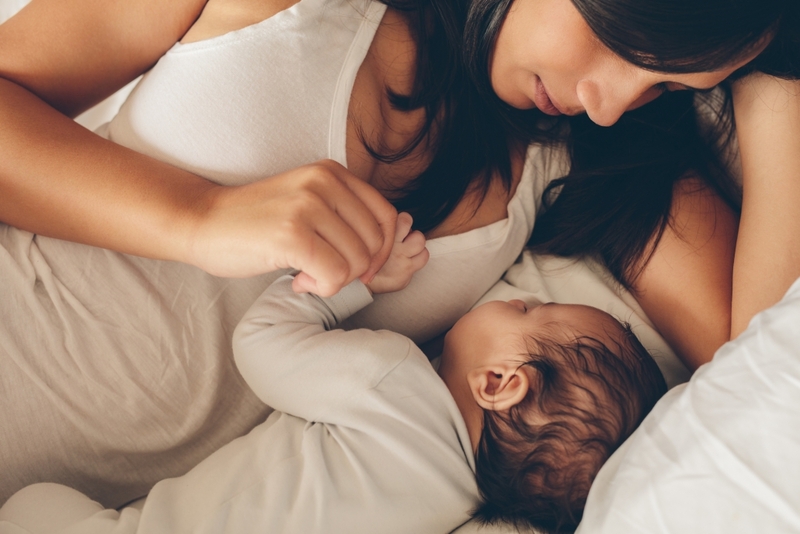 This may sound like a no-brainer for you, but for many new moms self-nourishment is often the last on their list – first is to just make it through the day. They don’t realize that those two things go hand in hand. What you put in your body has a HUGE impact on energy, moods and overall health. During that postpartum time, women are particularly vulnerable to the extreme bodily stresses of labour, breastfeeding, and very little sleep. In fact, consuming a diet of real food can help mitigate some of this stress, and can also help your postpartum body to heal faster. Give your food preferences to whichever friends or family members have chosen to organize your postpartum meals. Ask them to help you eat well so that you can heal well. The idea is simple: during your postpartum time, your home, or even just your bedroom if that’s more realistic, should be like a little sanctuary where peace and rest abound. It’s kind of like the modern version of lying-in. Your only job is to rest and bond with your delicious baby, and then to rest some more. This sanctuary should be respected by all who come to snuggle your baby. Ideally, your support system should be your gatekeepers protecting your privacy and seclusion. This is the place where your needs are the priority, and your body and emotions are nurtured — so that you can nurture your baby. Bonus tip: Have everything within reach, and don’t bother with pants, or even a shirt. Because if you have pants on, you’re more likely to get up and answer the door. But here’s the thing: not wearing pants reminds you that you’re already doing your one job – adoring and bonding with your baby. It’s natural, as the endorphins and adrenalin of childbirth begin to wear off that we feel a sense of anticlimax, a bit like a let-down. Your partner will provide some support, but there is a good chance they may not fully comprehend your range of emotions or appreciate how you could not feel anything but overjoyed by your new baby. You need another woman who has had children, who is emotionally sensitive and whom you feel you can be honest and open with. Another mother can understand how you can feel deep love and anguish at the same time. How you can be completely grateful and disappointed about the amazing miracle of childbirth. It can be profoundly comforting and affirming to have a friend and confidante who understands what postpartum really feels like. Don’t underestimate the power of friendship to see you through the craziness of postpartum life. If we reflect on our very real postpartum needs and are intentional about meeting them, we can eliminate a huge amount of stress and tears, and maybe even experience some peace during the postpartum period.